This program exists for those who have an interest in devoting their lives to helping humanity through the method of Guang Huan Mi Zong Buddhism and through the teachings of Holy Ziguang Shang Shi. After completing all the training and overcoming all obstacles and obstructions Red Robe Preachers should be pure of heart, powerful in their actions, and focused in their minds. They should reach a higher level, bridging the gap between higher dimensions and this world, shining like light for all beings to see the path to a better life. A Red Robe Preacher should be independent, establishing their own practicing and teaching centers around the world, and leading others to Guang Huan Mi Zong and Holy Ziguang Shang Shi. Ultimately they should prepare themselves to succeed the Holy Master, to receive the transmission of Dharma that he received from his master before, and carrying the unbroken lineage of Ultimate Truth originating from the Buddha forward to the next generation and spread it widely for the benefit of all beings in the world and beyond. 1. An associate’s degree or higher. 2. 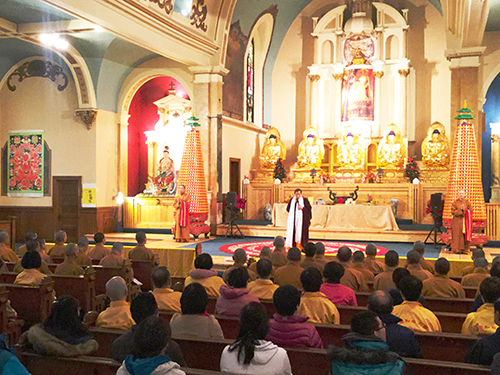 Dedication to the great mission and difficult task of learning and teaching Dharma. 3. Good moral character and virtuous conduct. This first step toward becoming a Red Robe Preacher is completing the Guang Huan Mi Zong Health Dharma introductory and advanced classes. Potential applicants can then make a request to enter the Red Robe Preacher Program and, if accepted, must then pass a 3 month probationary period. For those who are accepted tuition will be waived.